With my association with Bhutan in its 10th year I’ve had the privilege of exploring this unique Kingdom, training the local guides and guiding international clients on itineraries including Rafting, Kayaking, mountain biking, trekking and cultural itineraries. Only last year I ran the first ‘in country’ river guide training program and was invited as guest speaker at the Tourism Council of Bhutan Seminar, as the river industry develops further. I have also been involved with trying to help develop what is labelled as the Hardest 1 day mountain bike race in the world – ‘The Tour Of The Dragon’. The race idea was originally conceived by HRH the Prince who not only competed in the first races, but is still actively involved in its running and development. Having witnessed the race myself during a visit in 2013, and through discussions with the hosting body the Bhutan Olympic Committee (BOC), I returned in 2014 with the first UK competitor to complete the race. Many of you may remember the blogs and social media from September 2014, and followed the preparation and journey of James Griffiths who was one of the 21 finishers out of a total of 42 who started. James completing the 268km route, over four 3000m + metre high passes in a respectable 15 hours and 14 minutes to become the first UK person to complete the race. James Griffiths on the finishers podium. In 2015 Live The Adventure became the official European marketing partner with the BOC to highlight this unique event to international riders. In May 2015 I guided ‘Cyclist’ magazine across Bhutan on the race route to highlight not only the event but Bhutan as an international cycling destination. The article came out in the August edition in the UK and more recently made cover story for the middle East edition in April this year. In September 2015 I attended the race to present one of the prizes on behalf of Live The Adventure as one of the prize sponsors at that years event. 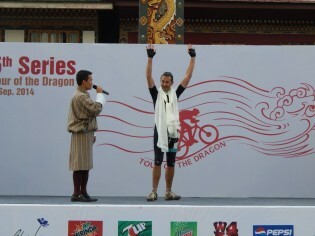 The unique prize was for the first Bhutanese rider to cross the finish line, to be hosted by Live The Adventure in 2016 to visit the UK and experience the mountain bike scene and attend and compete at a UK event with an international stage of riders. An opportunity for the winning rider to show the best of Bhutan, but also gain valuable experience to share and take back home with them. 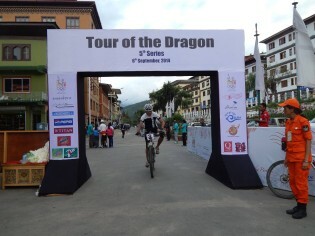 Sonam was not only the first Bhutanese rider to cross the line but also the overall winning rider in 2015 regaining his title for a 3rd time in the 6 year race history. Not only did he win but he did it in some of the worst conditions in an amazing 11 hours 55 minutes. It was an honour to be able to present him with this opportunity to attend the UK and compete and we are very much looking forward to his arrival tomorrow. He has been entered into 2 races over the next few weeks, the first being a 12 hour solo race at Bikefest in Bristol on the 11th June. He choose the race entries himself based on his endurance competition experience, and after this ‘warm up race’ will then have his biggest challenge on the weekend of the 18th & 19th June – ‘Mountain Mayhem’. Set in the grounds of the stunning Gatcombe Park, home to Princess Anne, the Mountain Meyhem team have given a very warm welcome and great assistance with Sonams participation They will also be showing media footage of The Tour Of The Dragon, and we’ll be hosting a stand with information on how to take part in this years race in Bhutan. The weekend will see the Live The Adventure team out in force to assist Sonam as he competes in the gruelling 24 hour solo race event. So an exciting few weeks ahead as we prepare for his time here including setting up his equipment, last minute race training, race weekend preparation and of course experience some of the UK’s best mountain biking venues with some sightseeing! As a 39 year old taxi driver for the Amankora resort, he has consistently been one of Bhutans top riders for the last few years. Mountain biking is in its relative infancy in Bhutan so it will be a massive change of scene for him to compete on an international stage and experience the well developed mountain bike scene and race events we hold here. You can follow his time here over the next few weeks on our Facebook and through our blogs and show your support as he leaves the only training ground he knows in Bhutan, to be the first to compete here in the UK.